ANCHOR. New. 8.08 x 5.56 cm. Nan A. Talese, 2003-10-28. Hardcover. New. Brand New Hardcover! Pristine unmarked pages, may have very slight warehouse wear, no remainder marks, it is a great buy straight from book warehouse unread, exact artwork as listed. We ship very quickly and try our best all the time. Thank you. Anchor, 2004-07-27. Paperback. Used:Good. In Stock. Always but with confidence. Anchor. Paperback. 0385495544 Please allow 4 - 14 business days for Standard shipping, within the US. Thank you for supporting our small, family-owned business! . Fair. 2004-07-27. New York: Random House Large Type, 2003 Thomas Cahill brings his characteristic wit and style to a fascinating tour of ancient Greece. 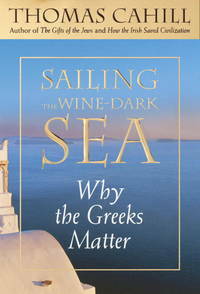 Explore the legacy, good and bad, of the ancient Greeks. the Greeks invented everything from Western warfare to mystical prayer, from logic to statecraft. Many of their achievements, particularly in art and philosophy, are widely celebrated, other important innovations and accomplishments, however, are unknown. . Clean and crisp (looks unread). Large Type Edition. Hard Cover. Near Fine/Very Good, Slight Chips. Large Type. Anchor. PAPERBACK. 0385495544 Special order direct from the distributor . New. Anchor. PAPERBACK. 0385495544 . New. Sailing the Wine Dark Sea. Doubleday, 2003. First edition, first printing. Fine in fine dust jacket, in mylar cover. B&W illustrations and photos. New York, NY: Doubleday, 2003. Book. Very Good+. Hardcover. American First. Complete number line from 1 to 10; minor wear; otherwise a solid, clean copy with no marking or underlining; collectible condition; illustrated with black and white photographs of Greek works of art..
Random House Large Print. PAPERBACK. B000OX9UN6 Like New. Five star seller - Ships Quickly - Buy with confidence! . Fine. New York, New York, U.S.A.: Doubleday & Company, Inc., 2003. FINE HARDCOVER. Blue cloth in blue pictorial jacket. In like new condition. 304 pp., the fourth volume of the Hinges of History Series.. First Edition. Hard Cover. Fine/Fine. 6 x 8".